Well-designed AMD all-rounder. 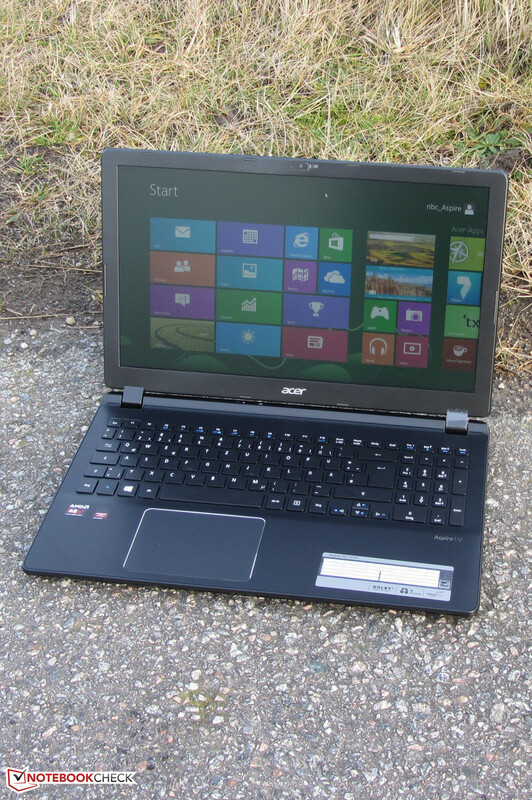 Acer demands approximately 500 Euros (~$683) for its slim Aspire V5-255G all-rounder. The list of equipment sounds promising: Quad-core processor, AMD dual-graphics, matte screen, aluminum components, backlit keyboard. Our test report reveals whether the Aspire convinces in everyday use. Nowadays there is no shortage of 15.6-inch all-round laptops. 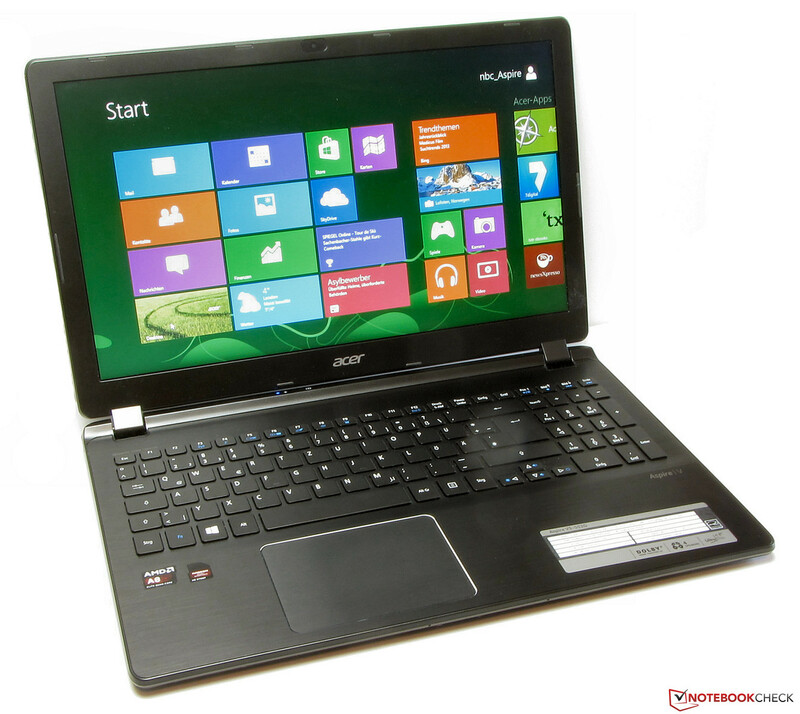 Acer expands the options with its relatively slim Aspire V5-552G. Besides high-performance hardware, Acer equips the device with a matte screen, and backlit keyboard. The latter is rather uncommon in the laptop's price range. We have seen a similar device in the form of the Acer Aspire V5-552PG-X809 (AMD A10-5757M, AMD Radeon HD 8650G + HD 8750M) reviewed by our American colleagues. This model, however, sports a touchscreen. 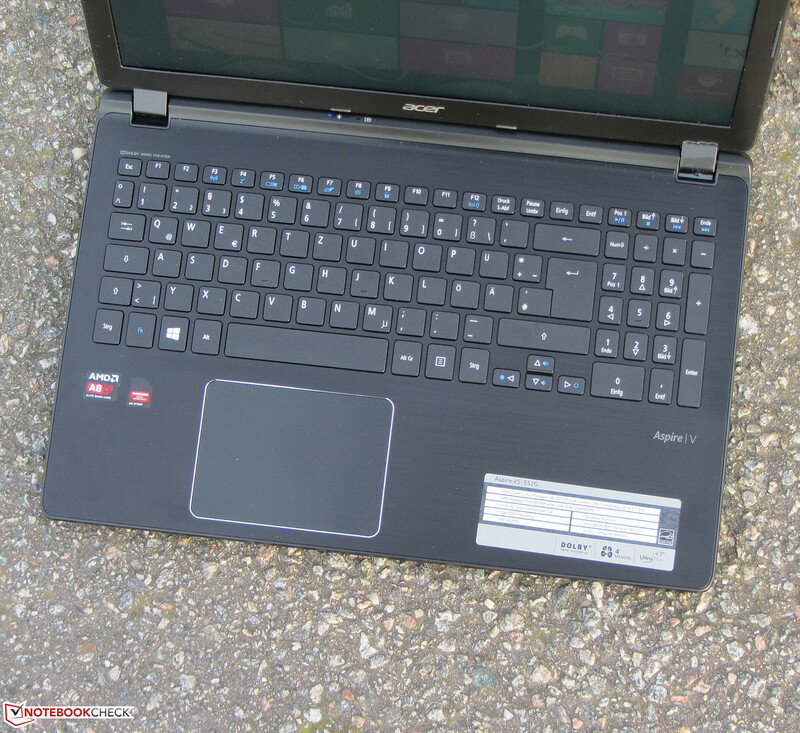 We also tested the identically built Intel counterpart, the Aspire V5-573G (Core i5-4200U, GeForce GT 750M). Our review shows whether the Aspire V5-552G is compelling. We used Dell's Latitude 3540 (Core i5-4200U, Radeon HD 8850), and Asus' F550DP-XX022H (AMD A8-5550M, Radeon HD 8550G + HD 8670M Dual-Graphics) to classify the laptop. 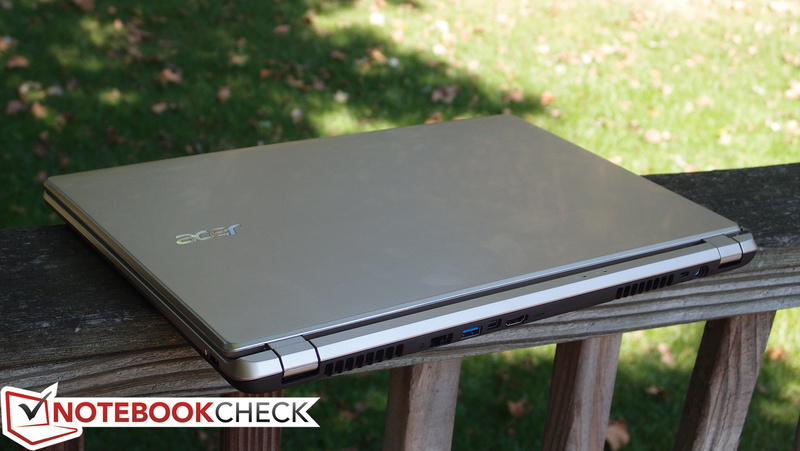 Acer uses a combination of plastic and brushed aluminum for its Aspire. The base unit's upper side is made of the light metal, and although the lid's back features brushed aluminum looks, it is plastic. 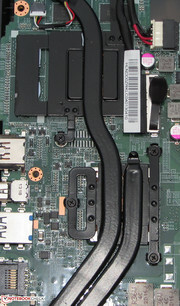 Dell also relies on metal components for its Latitude. 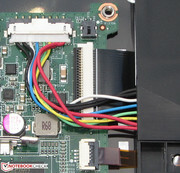 The F550DP features an allover plastic casing. Our review sample is completely black. Other configurations of the V5-552G are also available in silver. It is agreeable that all surfaces have a matte finish. The casing's quality and stability are appropriate for the price. 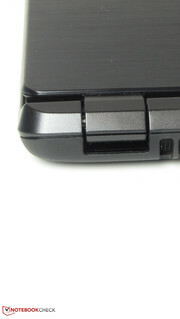 The casing can be warped a bit on the base unit's front. However, we have observed this behavior in many laptops. The base unit's stiffness is satisfactory, though we believe it could be a bit stiffer. This also applies to the lid to a much higher extent. It does not make a very solid impression, and it can be dented to such a degree virtually everywhere that image distortions are seen. The hinges keep the lid firmly in position, but wobble. Opening the lid with one hand is possible. Acer uses matte surfaces allover. The display's back is aluminum. Most ports have been placed on the Aspire's rear. Consequently, no cables will impair the areas on the wrist rest's left and right. 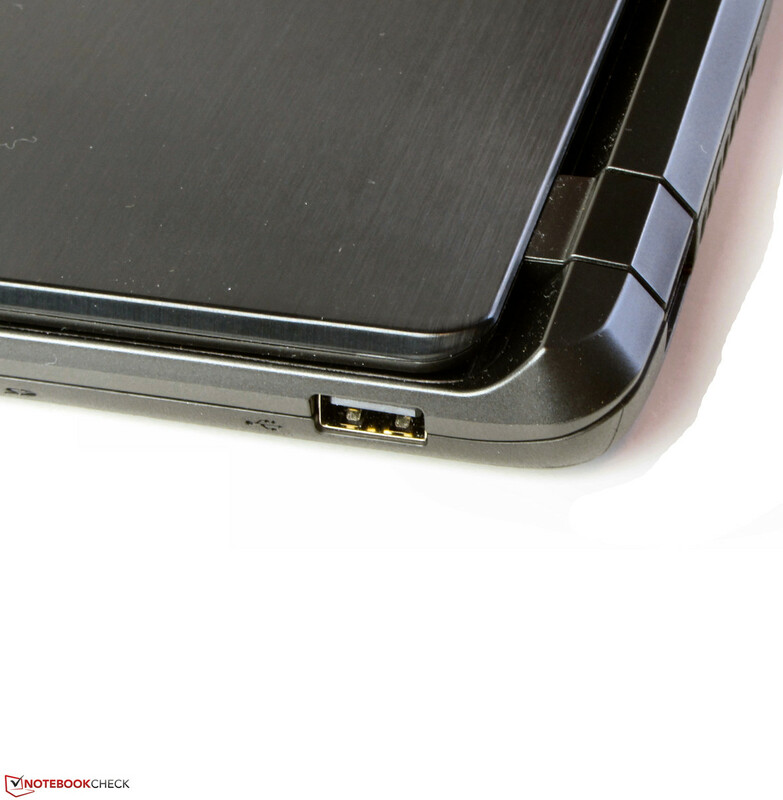 Overall, Acer installs the ports that are found in most laptops. That is also true for both contenders, with exception of Dell's Latitude that does not feature an HDMI out. 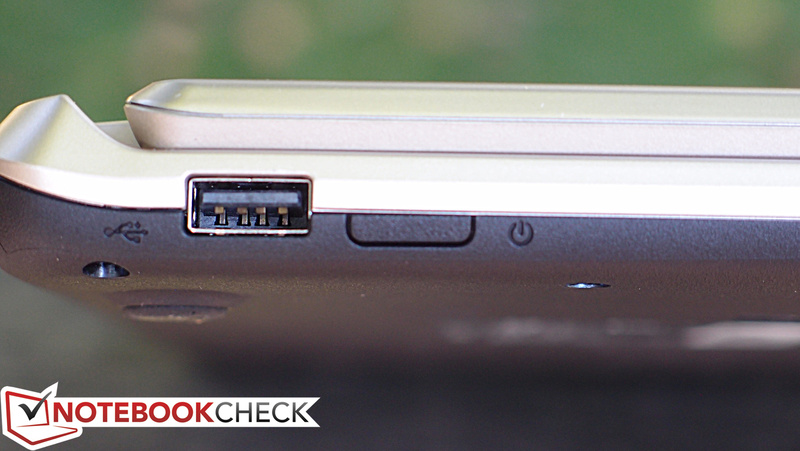 The Aspire is also the only device that has solely one USB 3.0 port. The V5-552G does not have a VGA out. Instead, it sports a mini-DisplayPort. Users who need a VGA out can retrofit this with an adapter for either the mini-DisplayPort or the HDMI port. It costs approximately 20 Euros (~$27). The Aspire also does not have an optical drive. 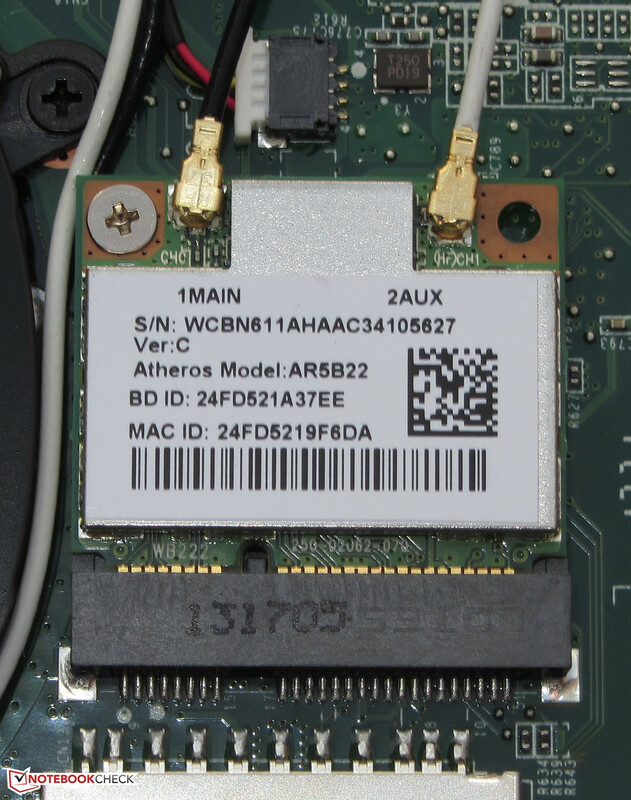 Atheros' AR5BWB222 Wi-Fi module takes care of wireless network connections. It supports the Wi-Fi standards 802.11 b/g/n. We did not experience any transmission issues. The connection was always stable in a radius of 15 meters around the router. However, this is not a standardized test. 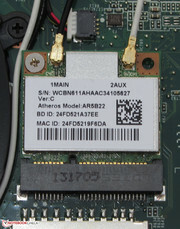 The Gigabit Ethernet chip in the Aspire also comes from Atheros, just like the Bluetooth 4.0 module. The webcam produces a slightly snowy picture with a resolution of up to 1280x720 pixels. The laptop comes with a quick-start poster, quick-start guide, and warranty information. Windows 8 (64-bit) operating system is pre-installed. There is no Windows DVD included, and thus a recovery medium should be created after the laptop's delivery. 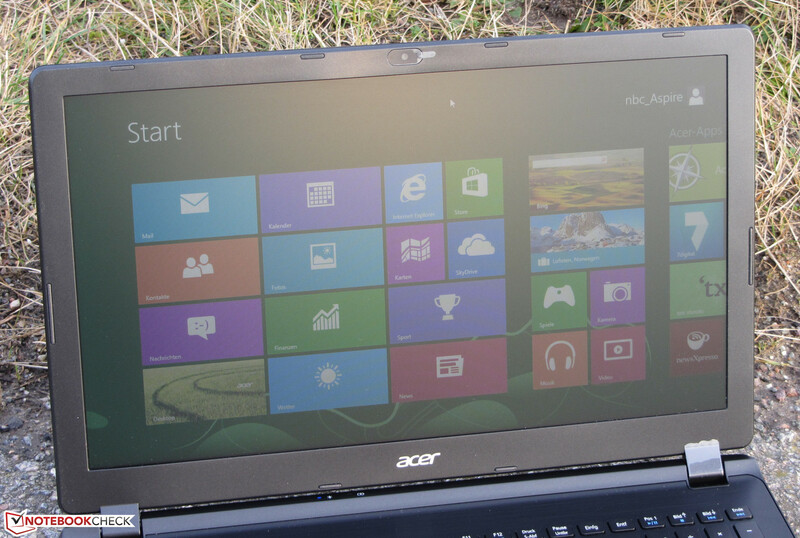 Acer's Recovery Management software is installed for this purpose. 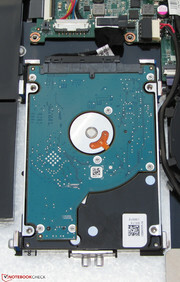 The backup can be created on a USB drive or DVDs. An external DVD burner is needed for the latter. A useful extra feature of the software: The installed drivers and applications can be backed up separately. The Aspire does not have a maintenance cover. 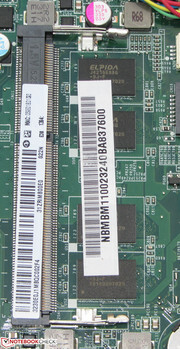 Nevertheless, it is not too difficult to access the hardware. 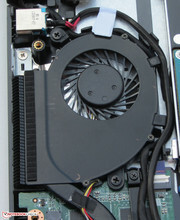 The base unit's underside has to be removed for this. After removing all the screws on the bottom, the underside can be carefully lifted off with a putty knife (available in a home-improvement center). After opening the casing, it is possible to access the working memory, hard drive, both fans, the Wi-Fi module, the BIOS battery, and the battery. The Aspire sports one empty working memory bank and 4 GB is soldered directly onto the board. 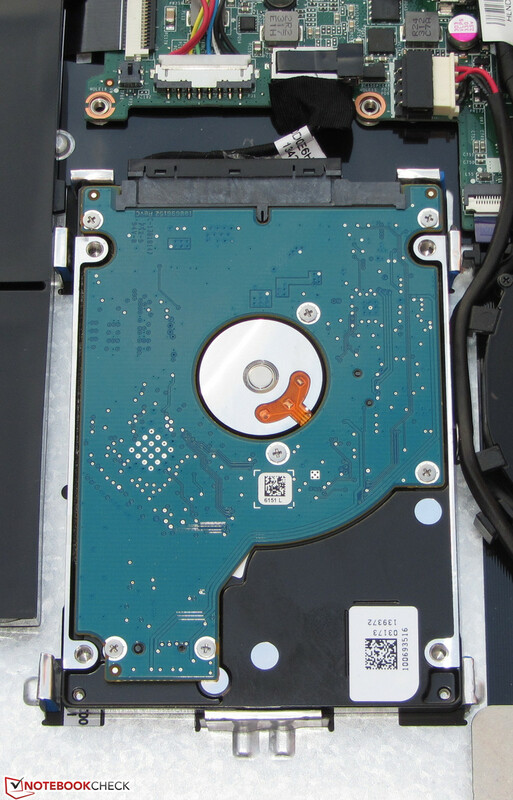 Replacing the hard drive is no problem. It is only laid in the casing, and can be taken out directly. Only 2.5-inch hard drives with a height of 7 mm fit. The battery could also be replaced. It is only secured with one screw, and plugged into the motherboard. The Aspire includes a 24 month warranty, just like the F550DP. Buyers of the Latitude can choose between a three-year base support and a one-year pro-support. The Aspire's warranty period can be upgraded. A three-year warranty costs approximately 80 Euros (~$109) and about 180 Euros (~$246) is charged for a five-year warranty. 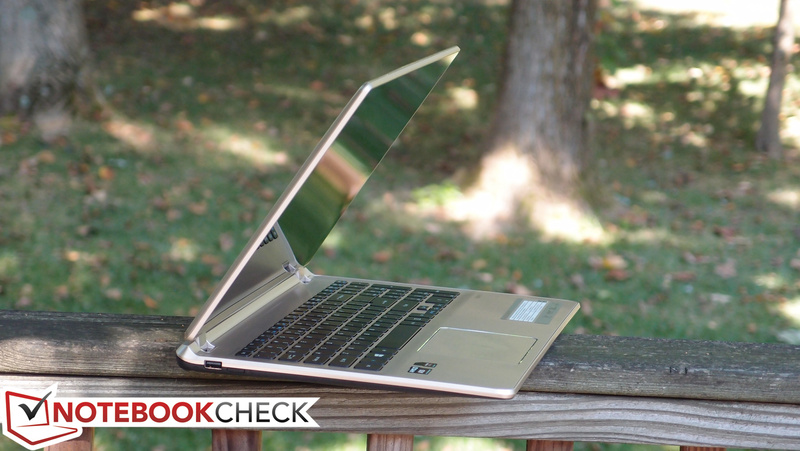 Acer treats the Aspire to a backlit chiclet keyboard. The light can only be turned on or off. 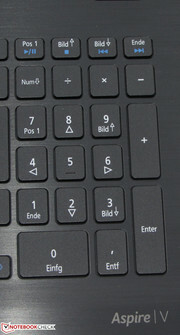 The primary keys feature a size of approximately 15 x 15 mm. Overall, the level, sleek keys exhibit a short drop, and clear pressure point. The resistance is also acceptable. The keyboard at most yields marginally while typing on it, but that does not have an adverse impact on writing. The mouse replacement is a very generously sized multi-touch capable ClickPad with a surface of 10.6 x 7.8 cm (i.e. 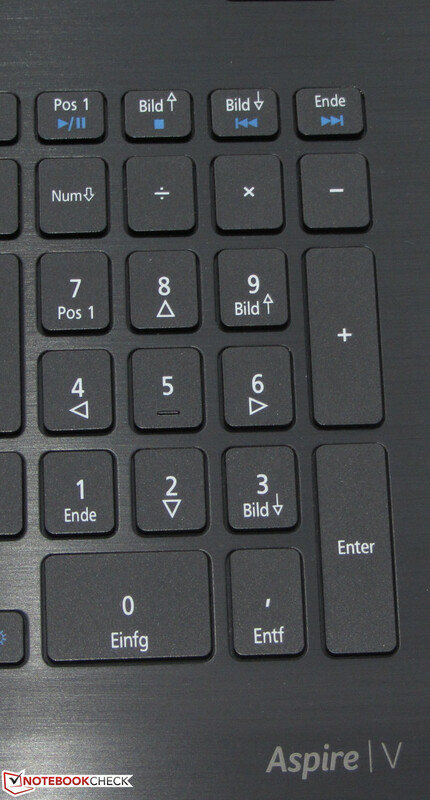 a touchpad without dedicated mouse keys; the entire pad is a button). Its sleek surface allows the fingers to glide effortlessly. The different multi-touch gestures can be turned on and off singly in the setup menu. Not all gestures are enabled by default. 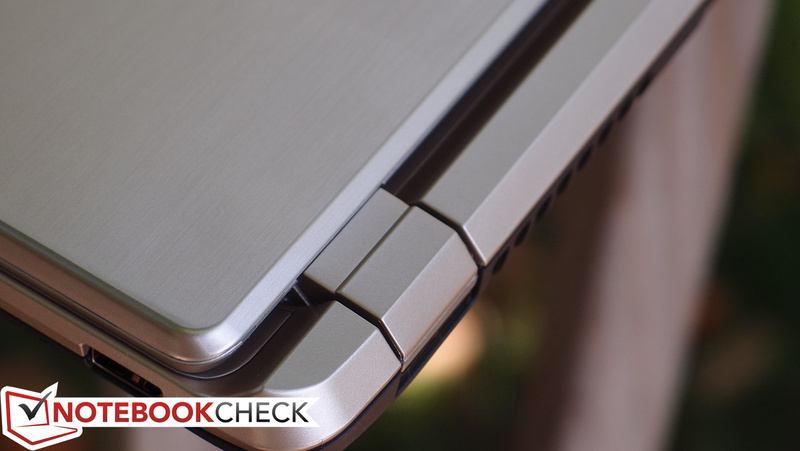 The ClickPad features a short drop, and a clearly audible and palpable pressure point. Acer fortunately installs a matte 15.6-inch screen with a native resolution of 1366x768 pixels in the Aspire. 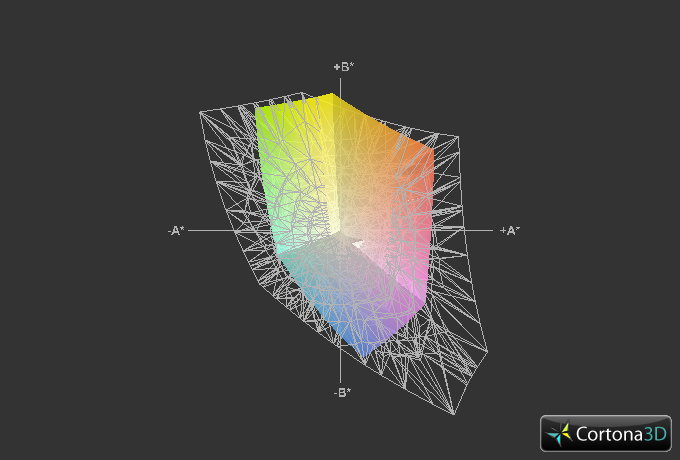 The screen's average brightness of just 181.8 cd/m² is in the lower midfield. The F550DP (215.2 cd/m²), and the Latitude (222.4 cd/m²) offer better rates, but they don't offer really good rates either. Both the contrast of 388:1 and black level of 0.5 cd/m² of the screen are anything but exceptional. The F550DP (218:1; 1.09 cd/m²) manages even poorer rates, whereas the Latitude (727:1; 0.33 cd/m²) offers throughout good rates. The Aspire's screen cannot reproduce either the sRGB or the AdobeRGB color space. sRGB is covered to 54.8% and the AdobeRGB to 38.9%. 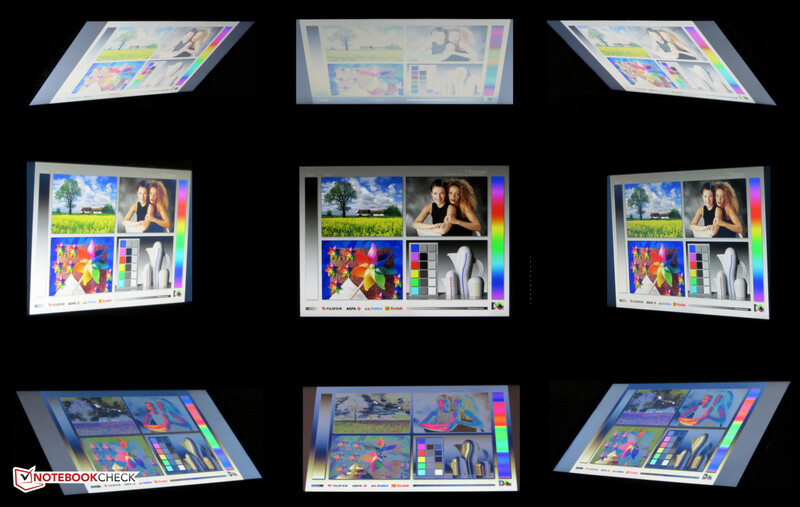 These color spaces are, for example, important for professional image editing. The screen's average DeltaE 2000 shift is approximately 8. Only yellow achieves the target range (DeltaE smaller than 3). The screen exhibits a bluish cast. Owing to the matte surface, the screen is quite suitable for outdoor use. However, overly bright surroundings should be avoided. The screen's viewing angle stability is within the usual range of low-budget laptops. 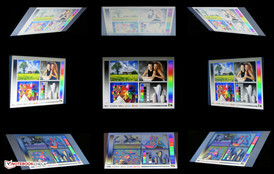 The angle is generous horizontally, and even several viewers can look at the screen at the same time. Content can also be read from the sides, but the picture gets darker the larger the angle. The image quickly distorts when the horizontal viewing angle is altered. 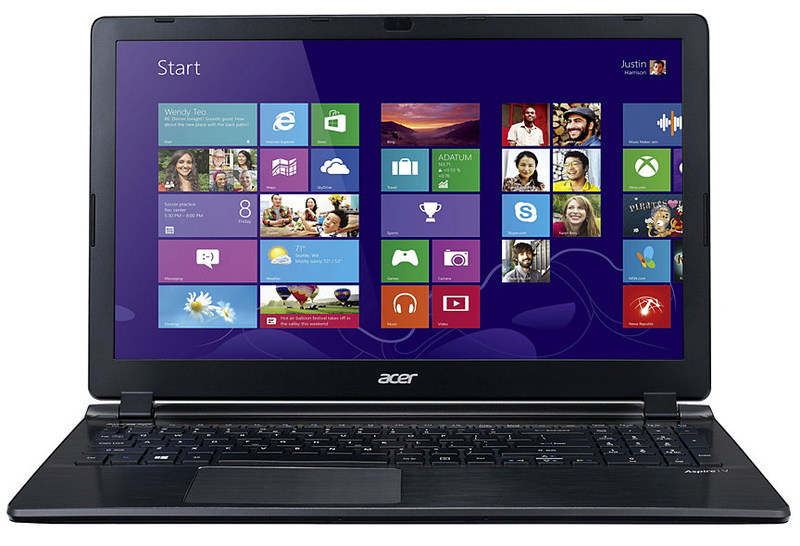 Acer offers an affordable 15.6-inch all-round laptop with the Aspire V5-552G. Besides routine tasks, such as video playback, office work, Internet browsing, etc., the computer even copes with up-to-date computer games. Our review sample is sold for approximately 500 Euros (~$683). We found another model from the range dubbed Aspire V5-552G-10578G1Taii at the time of writing. It sports a stronger A10-5757M APU, 8 GB of working memory, a 1 TB hard drive, and a silver casing for approximately 600 Euros (~$820). 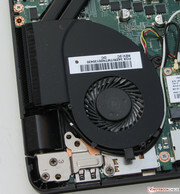 Acer equips the Aspire with AMD's A8-5557M APU, based on the Richland architecture. The APU's CPU part is a quad-core processor that clocks with a base speed of 2.1 GHz. That can be accelerated up to 3.1 GHz via Turbo (AMD Turbo Core). AMD specifies a TDP of 35 watts for this APU. The processor ran the single-thread tests of Cinebench with 2.8 GHz. One to two cores were occasionally boosted to 3.1 GHz. The multi-thread tests were performed with 2.1 to 2.4 GHz. The four cores consistently fluctuated between these speeds. Thus, the Aspire remains slightly behind its possibilities in multi-thread applications. The scores of the Aspire and the F550DP (AMD A8-5550M, Radeon HD 8550G + HD 8670M Dual Graphics) are on par. We expected this since both laptops practically sport the same CPU. Neither laptop can compete with the Latitude (Core i5-4200U, Radeon HD 8850M). The Core i5 in Dell's laptop is clearly superior to the AMD competition. However, we should keep in mind that the Core i5 is only a dual-core processor that also clocks at a lower speed. The quad-core processor in the Aspire is on the level of the current Haswell Core i3 ULV processors, such as the Core i3-4010U, in terms of performance. The Latitude also wins the Cinebench GL tests. It sports the strongest GPU. The system runs smoothly and without glitches. 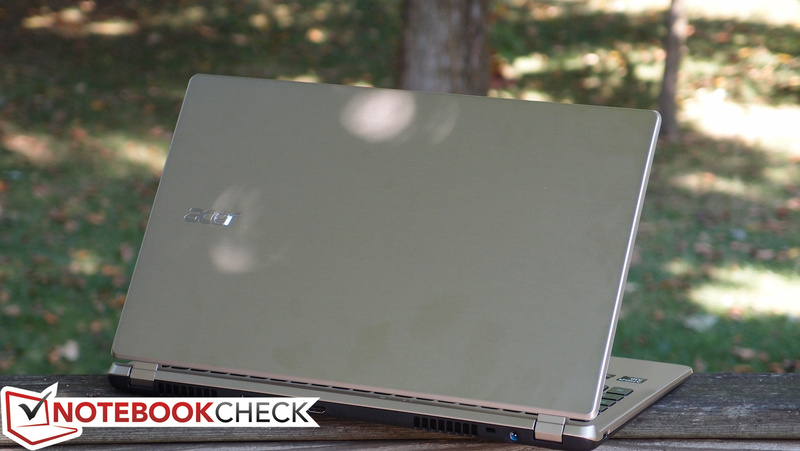 The PCMark benchmarks scores are also as we expected from a laptop featuring an AMD APU. 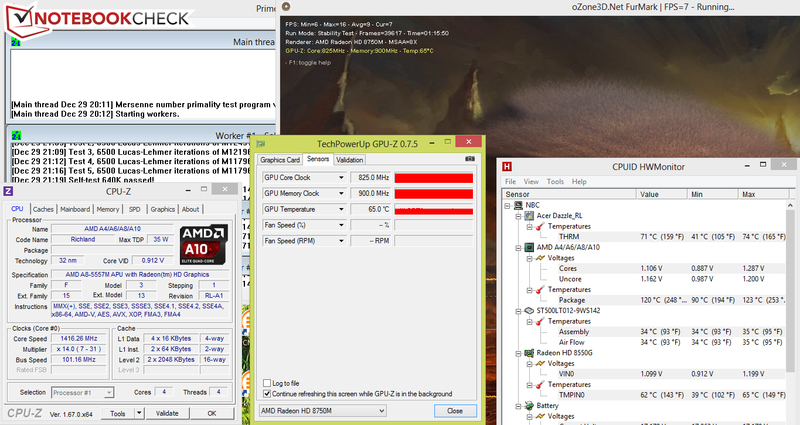 The F550DP (AMD A8-5550M, Radeon HD 8550G + HD 8670M) clearly lags behind although it practically sports the same APU. 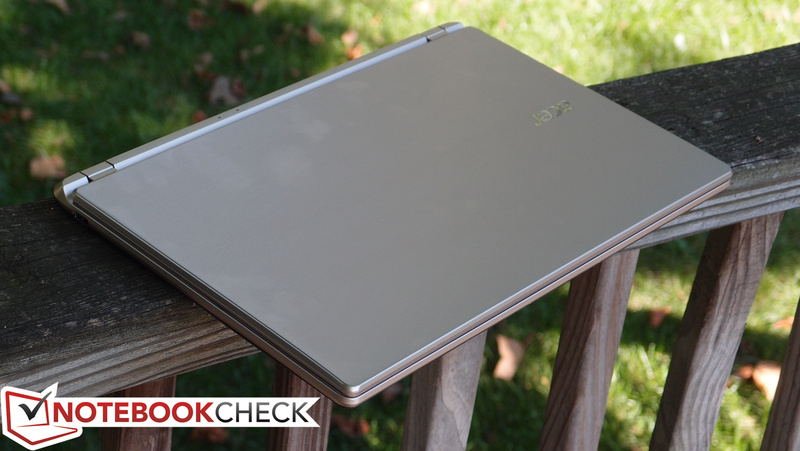 We think this is due to the weaker dual-graphics solution in the Asus laptop. Neither laptop can compete with the Latitude (Core i5-4200U, Radeon HD 8850M). It sports both a stronger processor and GPU. 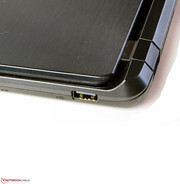 Users who want to upgrade the Aspire should equip the laptop with a solid state drive. We tried it out: Windows booted faster, and the system worked overall swifter. The SSD achieved better results in the PCMark benchmark scores. Our Crucial RealSSD C300 - 64 GB SSD boosted the PCMark 7 score by about 70% to 3243 points. Acer installs a hard drive from Seagate's Momentus Thin Series in its Aspire. It has a capacity of 500 GB, and spins with 5400 revolutions per minute. CrystalDiskMark recorded a read speed of 83.28 MB/s. HDTune delivered an average transfer rate of 83.8 MB/s. These rates are acceptable for a 5400 rpm hard drive. 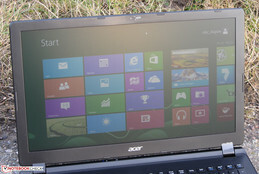 Acer uses a dual-graphics solution in its Aspire. 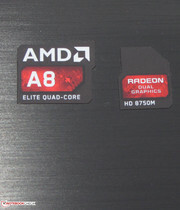 Besides the integrated Radeon HD 8550G, the laptop sports a dedicated Radeon HD 8750M graphics core. Both GPUs support DirectX 11. 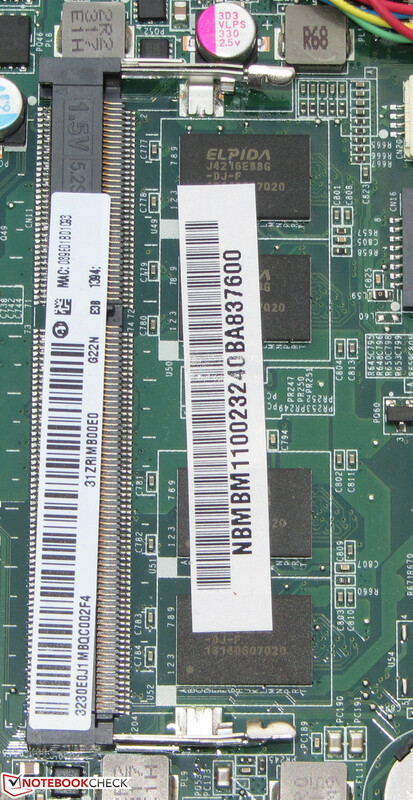 The two chips form a so-called Crossfire array, i.e. 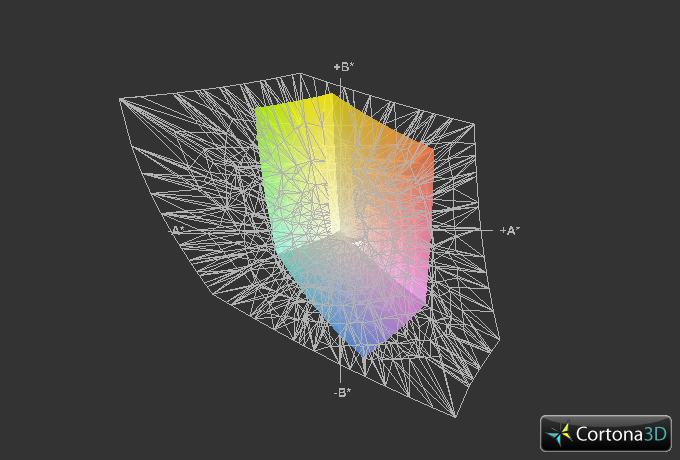 both cores can calculate the rendered images. That is, for example, often the case in computer games. Only the integrated GPU is used for less performance-demanding tasks, such as DVD playback, or in battery mode. Nevertheless, it is possible to determine whether single applications are to be performed with the dual-graphics solution in the driver menu. The dual-graphics can also be completely disabled so that only the integrated GPU is used. The Aspire prevails over the F550DP (AMD A8-5550M, Radeon HD 8550G + HD 8670M) in all 3DMark benchmarks. That is not really surprising since the Aspire sports the stronger dual-graphics. Apart from one exception, the Aspire does not stand a chance against the Latitude (Core i5-4200U, Radeon HD 8850M). 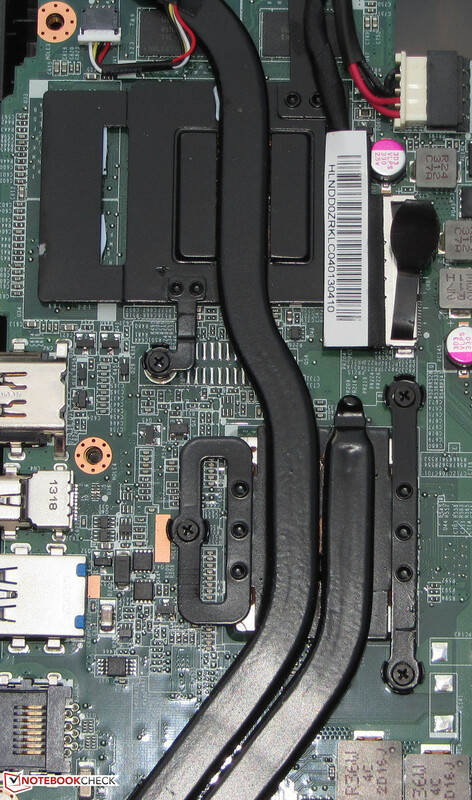 The CPU and GPU in Dell's laptop are stronger than the counterparts installed in the Aspire. 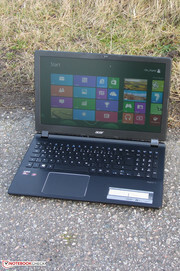 Acer's wide range of laptops allows a direct comparison between the Aspire V5-552G, and a laptop without a dual-graphics but a Radeon HD 8750G. 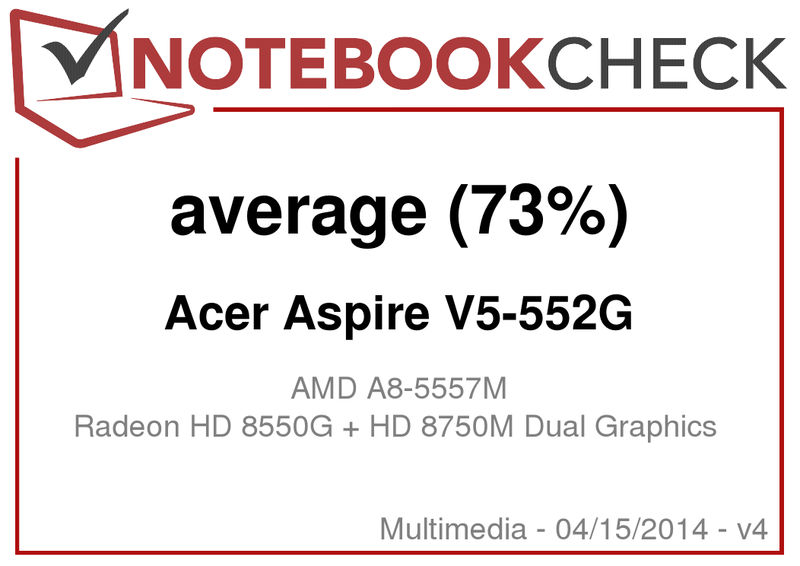 A matching laptop is the Aspire E1-572G (Core i5-4200U, Radeon HD 8750M), and it mostly achieves better scores. The V5-552G only has the lead in 3DMark 2011. The E1-572G also scores better in pure GPU-based tests, such as Cinebench's GL tests. We disabled the dual-graphics, and reran the benchmarks to see how well it scales. Only the integrated CPU runs in this case. The scores are basically tied: Sometimes the dual-graphics has the lead, and sometimes the integrated GPU. The Aspire can render most modern games smoothly using the screen's native resolution and medium to high quality settings. In terms of performance, the Aspire is between the Latitude and the F550DP. This confirms the scores achieved in the various 3DMark benchmarks in real use. We additionally tested many games without the dual-graphics to ascertain to what extent the Aspire benefits from the dedicated GPU. Thus, only the HD 8550G graphics core calculates the graphics. The dual-graphics achieves higher frame rates than the integrated GPU only in a few cases. The GPUs mostly deliver the same frame rates, but the iGPU provides higher ones occasionally. Buyers of this laptop will thus have to try which combination delivers the highest frame rate for each game. The first alternative for higher gaming power is the Latitude. It provides a 30% higher frame rate than the Aspire on average. However, it also costs almost 200 Euros (~$273) more than the Aspire. 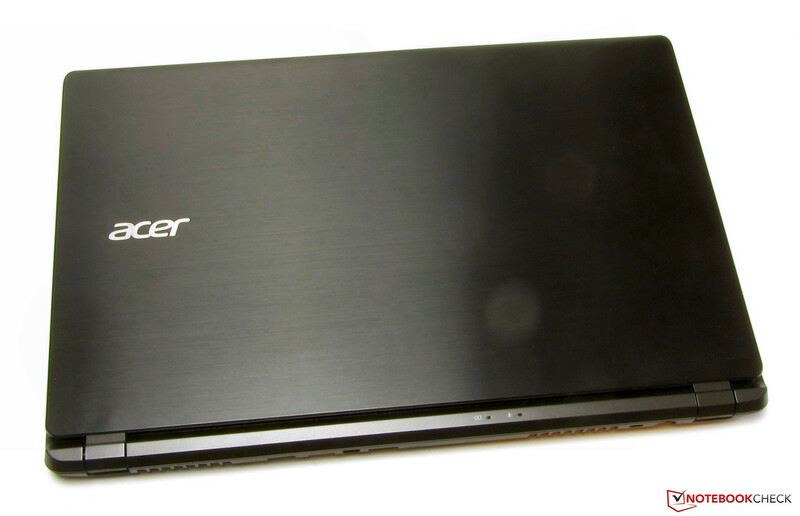 Another higher-performance alternative might also be Acer's Aspire V5-573G (Core i5-4200U, GeForce GT 750M). 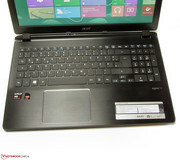 The laptop features a matte, Full HD IPS screen, but no Windows operating system for approximately 600 Euros (~$820). The Aspire operates quietly when idling. The fan is only audible in very quiet surroundings. We accordingly measured a noise level ranging from 29.8 to 32.8 dB. The Latitude (31.6 to 33.6 dB), and the F550DP (31.4 to 34.1 dB) are slightly louder. The Aspire's noise clearly increased to 39.8 in medium load via 3DMark06 and 42.6 dB during full load in the stress test via Prime95 and Furmark. 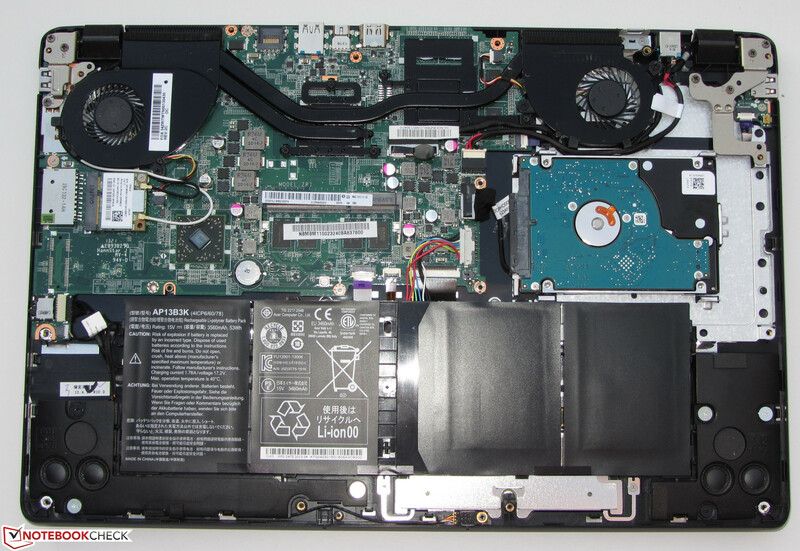 After all, the laptop sports a lot of high-performance hardware that needs cooling. Both the Latitude (40.2 and 43.5 dB), and the F550DP again deliver slightly worse rates. The idle temperatures on the surface of all three laptops are within an acceptable range. None of the devices heat up excessively. The temperatures increase moderately during load. The Aspire heats up strongest in some places. It reached almost 50 °C on the underside in the fan's area. The CPU ran the stress test (Prime95 and Furmark run for at least one hour) with very fluctuating speeds in AC mode. The entire range from 900 MHz to 2.8 GHz was used. The speed mostly ranged from 1.7 to 2.4 GHz with stress on 2.1 GHz. 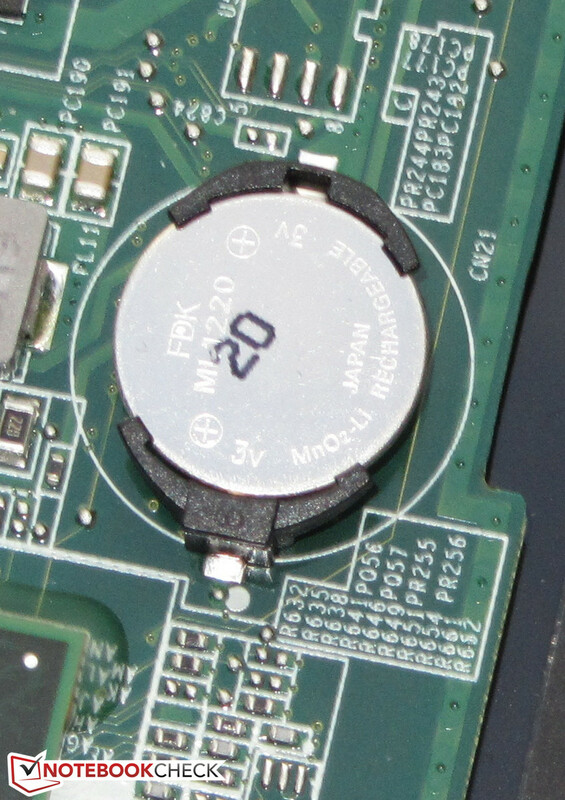 The integrated GPU usually ran with 253 MHz. It was repeatedly accelerated, and used the entire range up to its maximum clock of 720 MHz. The dedicated GPU consistently ran at its full speed of 825 MHz. Things were slower when we performed the stress test in battery mode. The CPU clocked with 2.1 GHz, the integrated GPU with 253 MHz, and the dedicated graphics unit with 400 MHz. Although the CPU's speed fluctuates extremely, the Turbo speed is permanently available in routine use - but not always to its full extent. 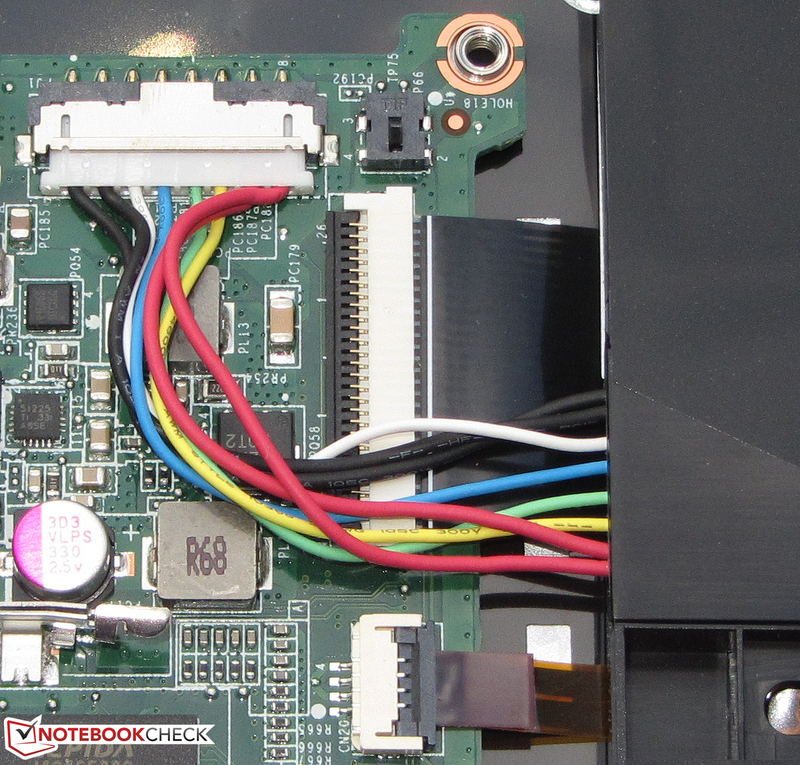 According to HWMonitor, the CPU's temperature settled to approximately 120 °C in AC mode. We deem this rate to be too high, and presume a read-out error on the part of HWMonitor. (-) The maximum temperature on the upper side is 45.5 °C / 114 F, compared to the average of 36.5 °C / 98 F, ranging from 21.1 to 71 °C for the class Multimedia. (±) The average temperature of the palmrest area of similar devices was 29.1 °C / 84.4 F (+0.7 °C / 1.3 F). The Aspire sports 2 x 2 speakers that are located on the casing's lower front edge. They produce a rich sound that, however, lacks bass. The sound is overall acceptable. Users who want a higher-quality sound experience will have to use external speakers or headphones. The Aspire's idle power consumption ranged from 8 to 14.6 watts. The Latitude (6.3 to 10.8 watts), and the F550DP (8.1 to 12.2 watts) are a bit more energy-efficient. The Aspire's power consumption climbed up to 56.5 watts in medium load via 3DMark06 and 63.2 watts during full load in the stress test via Prime95 and Furmark. Again, both the Latitude (50.7 and 52.7 watts) and the F550DP (32.7 and 56.7 watts) are slightly more frugal. The reason that the Latitude consumes less power than its contenders although it sports the stronger hardware is simple: It is equipped with a ULV processor (TDP: 15 watts), while the contenders feature standard mobile processors (TDP: 35 watts). The Aspire's battery lasted for 10:15 h in idle mode. 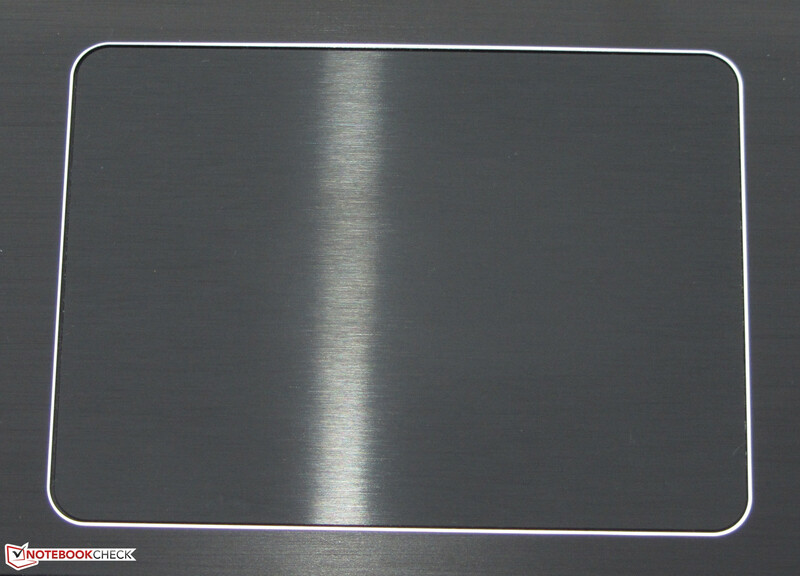 The Latitude (12:34 h) has a longer runtime, and the F550DP (6:32 h) is drained much sooner. 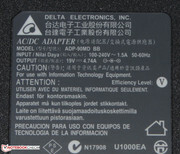 Idle mode is tested using Battery Eater's Reader's test with minimum screen brightness, enabled energy saving mode, and disabled wireless modules. The Aspire shut down after 1:36 h of load. It is thus positioned between the Latitude (1:56 h) and the F550DP (1:06 h). The load runtime is ascertained using Battery Eater's Classic test with maximum screen brightness, high-performance profile, and enabled wireless modules. The Aspire ran the Wi-Fi test for 5:09 h. The Latitude (5:34 h) only lasts a few minutes longer. Again, the F550DP (3:16 h) is defeated by the contenders. Websites are opened automatically every 40 seconds, the energy saving mode is enabled, and the screen's brightness is set to approximately 150 cd/m². To ascertain the video playback runtime in battery mode, we ran Big Buck Bunny (H.264 encoding, 1920x1080 pixels) in a loop. The energy saving profile is enabled, the wireless modules are off, and the screen's brightness is set to 150 cd/m². The Aspire managed a runtime of 4:21 h. We did not perform this test with either contender. All said, the Aspire offers good battery runtimes. It is not surprising that it cannot beat the Latitude. 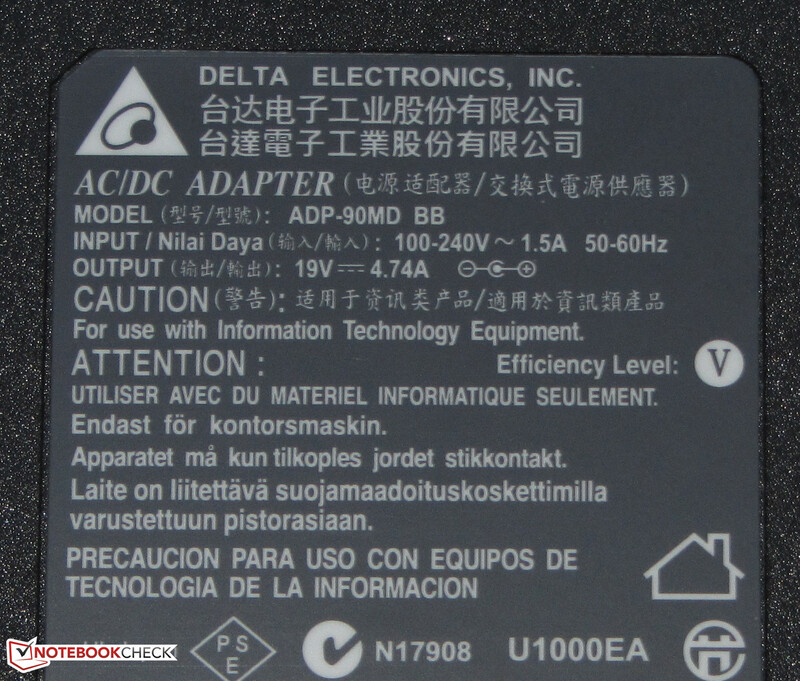 Dell's laptop sports the highest capacity battery (Acer: 54 Wh; Dell: 65 Wh; Asus: 44 Wh), and consumes the least power in idle at the same time. Acer's Aspire V5-552G provides a decent application performance, and copes with most up-to-date 3D computer games. The dual-graphics, however, does not really add an advantage in games. Higher frame rates are rarely achieved compared with the integrated GPU. 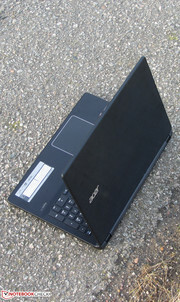 The laptop operates quietly during idle, and provides good battery runtimes. It also scores with small things like the backlit keyboard. Opting for a matte screen is praiseworthy. However, Acer unfortunately uses a quite dark, low-contrast model with a bluish cast. Considering the laptop's purchase price, this is still acceptable though. All in all, Acer supplies an all-round device that is in-line with the price. Dell's Latitude 3540 is interesting for all users who want more computing power, slightly better battery runtimes, and/or a matte Full HD screen. However, the laptop also costs about 200 Euros (~$273) more. Asus' F550DP-XX022H is inferior to the Aspire in a direct comparison. Its price is on par with Acer's laptop, but its gaming power is lower, and the battery runtimes are shorter. 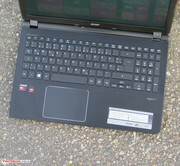 In Review: Acer Aspire V5-552G-85554G50akk, courtesy of Acer Germany. The base unit's upper side is metal. The casing can be opened. 4 GB is soldered and there is an additional working memory bank available. The APU and GPU are soldered. ..but two fans are installed. Good: There are two Wi-Fi antennas. The BIOS battery can be exchanged. Only one screw secures the battery. It is plugged into the motherboard. 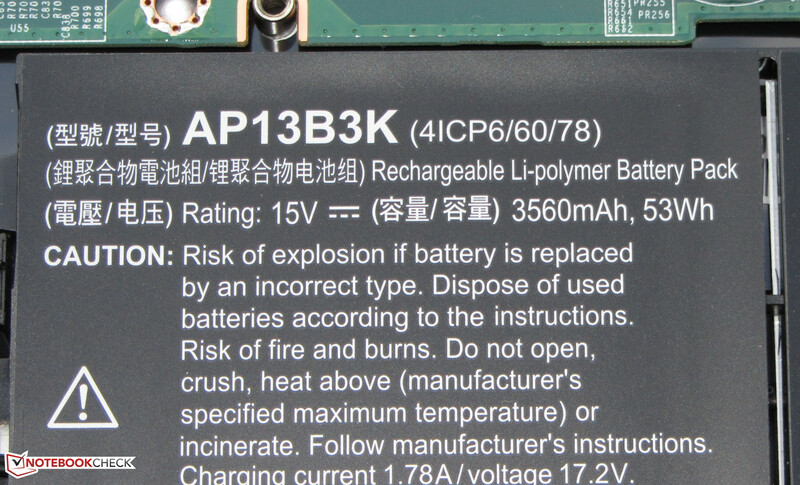 The battery has a capacity of 53 Wh. The power supply weighs roughly 329 grams. It supplies a power output of 90 watts. A lot of computing power is under the hood. The Aspire is also available in silver configurations. The decent application and gaming performance, and the good battery runtimes. A brighter and higher contrast screen. We don't see a backlit keyboard in a 500 Euros (~$683) laptop every day. 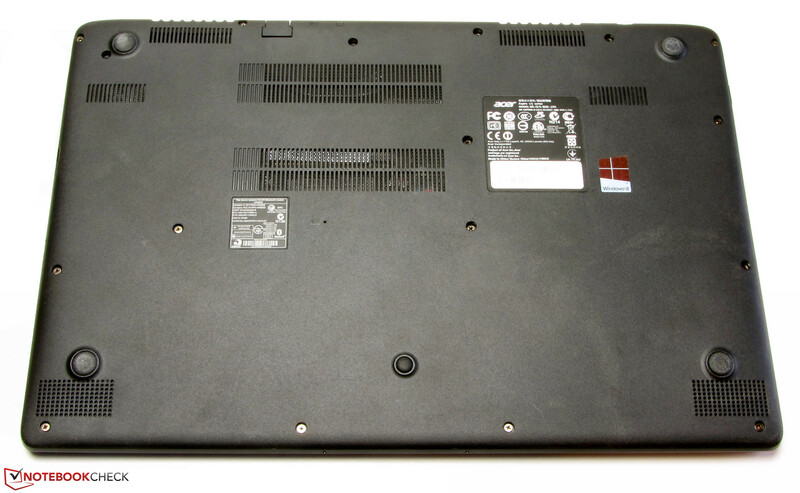 Dell Latitude 3540, Asus F550DP-XX022H, Lenovo G505s, HP Pavilion 15-e052sg, Toshiba Satellite M50-A-11L, Aspire E1-572G, Aspire V5-573G, Lenovo IdeaPad S500, Lenovo IdeaPad Z510, Toshiba Satellite C855-2J4.